Elegant Brie wins Sofi Gold!! Congratulations to Elegant Brie who has just won its first gold Sofi Award for their decadent Mushroom, Garlic, and Scallion baked brie! Media Owls first discovered Elegant Brie last year at Los Gatos Farmer’s Market one lazy Sunday morning. I was in search of a special treat to bring to a housewarming open house. I, of course, had waited until the last minute to put together something special for a good friend’s party and needed it to appear that I had actually planned ahead and put lots of thought into it! Elegant Brie to the rescue. I brought home a beautiful brie en croute (the brie’s rind is removed) loaded with sautéed mushrooms, garlic and scallions. I should have taken a picture when I placed it on the guest table. By the time I thought to get my camera, the guests had torn into it like hungry savages. I should get some credit for saving my friends the embarrassment of photographing them scraping for the last, tasty remnants. 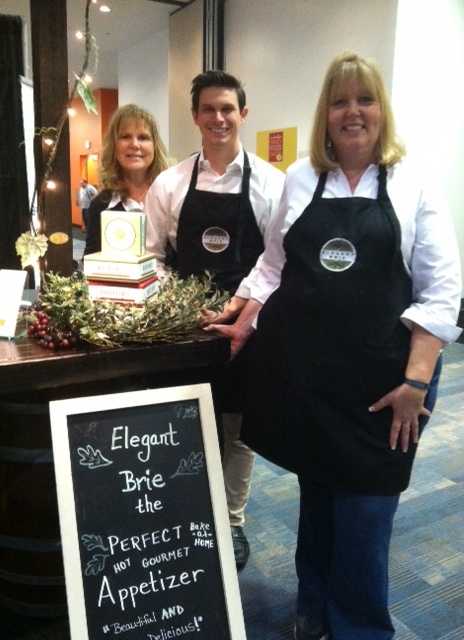 Elegant Brie booth at SF Fancy Food Show 2014. Crew includes Leslie (The Big Cheese) and Linda (Chief Cheese Officer). Since I have attended this show in the past, I was able to learn from my previous mistakes, which included: feeling obligated to try everything, struggling to see everything, and not staying focused on the products that the press would see as distinctive and newsworthy. Armed with experience, I was able to roam the floors with a vague, pleasant eye that managed to avoid the things that have been done before and zero in on what was of interest to me from a PR point of view. 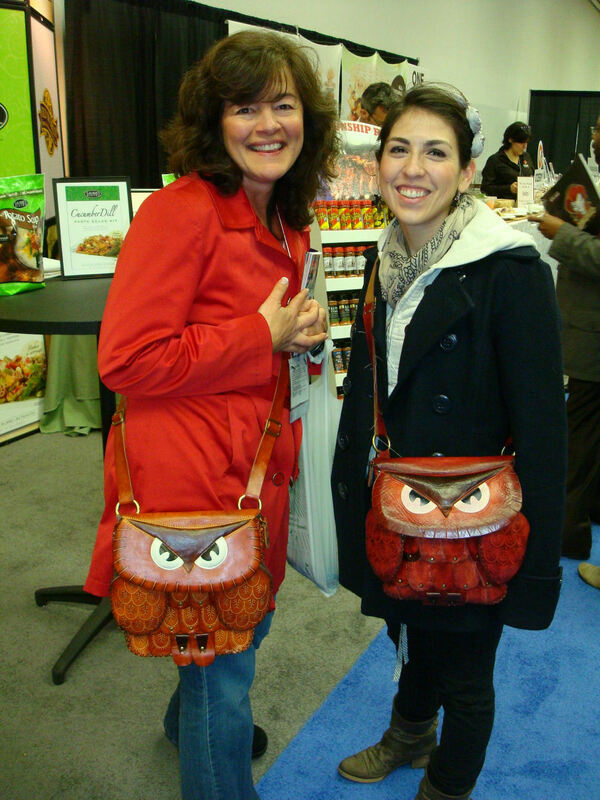 When I first arrived at the show I was stopped by a nice gal who happened to be from Route 29 Carmels & Sweets who wanted to compliment me on my purse! You can see why below– twin owls! I took this as a sign that this show was sure to be a successful endeavor! I was already in great company! The following are a few of the more interesting items found at the Fancy Food Show. Some are selected according to my own delights and prejudices. I gave preference to the local, most of the products are odd or intriguing, all are treats the press would surely like to tell their audiences about. I was so pleased to meet the folks from Bread Armor. They produce storage bags that keep Artisan bread fresh longer. 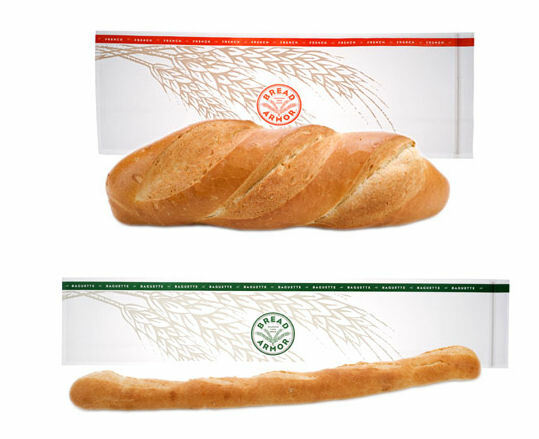 They are resealable, reusable and recyclable with sizes to fit baguettes, ciabatta, french bread and more. Why these aren’t available next to the artisan breads right now, I want to know! I have a freezer full of croutons made from not-so-fresh- anymore french bread. Great idea–don’t you think?? Honestly, I found Fortun’s Finishing Touch Sauces almost by mistake…. It was the end of the last day of the show and most vendors were simply trying to pawn off their perishables. We happened by the Fortun’s and were given full packets of their Marsala & Mushroom and the Lemon Dill Caper with White Wine sauces. When I got home these were the first items that caught my husband’s eye…. I should tell you that my husband is quite the gourmet cook (lucky me!) and the best BBQ chef in town — seriously. He makes everything from scratch, buys all his veggies at the local farmer’s market — come on– he even raised his own steer because he wanted to make sure it was organically grass fed. Ask anyone — he’s a legend. He had planned to BBQ pork chops for dinner and I showed him the Marsala & Mushroom- although not traditionally served with pork, he was completely impressed with the flavor and quality of the sauce. Fortun’s passed a test I never thought any packaged sauce could. I definitely want to get in touch with Kevin Fortun!! I’m a believer!! We have had Arette Tea Seed Oil on our radar. With subtle nutty flavor, tea-like aroma, and high smoke point, Arette Tea Seed Oil is excellent for dressings, baking, stir-frying and more. High in nutrition and 100% organic are among the many benefits of this unique Tea Seed Oil — and theirs is a story that is just waiting to be told to the world! This year we were very impressed with their new infused tea seed flavors- especially enjoyed Tea Seed Oil Infused with Sun Dried Tomatoes & Chilli Pepper. We worked our way over to the Savor California Section and had the pleasure of tasting the Agave Dream Ice Cream Collection. The company strives to produce sorbets and ice creams that are “guilt-free.” Agave Dream contributes a portion of its proceeds to worthy causes like juvenile diabetes. We especially enjoyed their Pomegranate Acai Sorbet and Cinnamon Ice Cream flavors!